t.greer recommended to me a paper on the mating patterns of the turkana of east africa (thanks, t! ): Mating Structure of a Nomadic Pastoral Population (1982). – and they appear to contradict the notion that pastoralists tend to inbreed (see explanations from anthropologists the world over). hmmmm. the turkana who practice pastoralism (most of them — a few are agriculturalists) apparently do bring their herds (of camels and goats) uphill for grazing in the summer, but mostly they reside in the valleys, and they consider themselves to be flatlanders rather than mountaineers. from the paper, we learn that the turkana have clans (28 patrilineal clans) [pg. 472], that they avoid marrying within those clans — in the study, 96% of those surveyed were married to someone from another clan [pg. 474], and that they even try to avoid marrying anyone closer than second cousins [pg. 472]. so, what is turkana society like? what are their family types like? what about these clans then? “The family comprises a man, his wife or wives, his sons and their wives and children, and his unmarried daughters. In the homestead there might also be a grandparent or other relative and a concubine (a woman living in the household to whom he is not married). “The man is the head of the family. The family is represented economically by its herd of livestock…. “Among the Turkana, the extended family (*ngi-tungakothi*) is made up of all males who can claim common descent on the male side. The unit could go back three or four generations. To members of the group, those within it are ‘our people.’ But strictly speaking, the extended family also includes the wives of each of these men if they have raised a child to walking stage. It excludes women who have married elsewhere and are no longer in the family. “judicial compensation” there is interesting. is that like wergeld? dunno. will have to find out more. “Every Turkana belongs to a clan (*ateger*), of which there are about 20. They fall into two major types: the large, widespread clans, each comprising over 1,000 adult males, and the very small ones consisting of only about 30 members. “Although the Turkana lack highly structured kin groups, territories, and a formal political system, they do establish and maintain large networks that amount to a kind of effective community for each homestead. First, hamletlike groups of close relatives and friends live and move together for part of the year. Second, such groups cluster within convenient walking distance of one another, and men in such a cluster meet often to take turns distributing freshly slaughtered meat and to share information on herds and pastures. These two levels of social organization (Gulliver calls them primary and secondary neighborhoods) provide the individual househead with a network of friends through which food and information flow, friends from whom he may beg insistently as a good Turkana should (Gulliver 1951; Patton 1982) and who will cooperate with him in defense against raiding. Although a family is free to move at will, in practice families tend to move with their neighbors and settle near them at new locations…. “The main cement of Turkana social organization, however, is the exchange of livestock. A nuclear family’s herds are all owned and managed by the father; and although their daily care falls to women and boys, spread over the countryside, there is a strong sense of the essential unity of the family and its herd. Some hamlet groups are the remnants of old extended families whose senior male has died: in such cases the brothers and in-laws continue to live near each other, and, because their herd once had a common owner, the men continue to feel part of one family. Often, as we have seen, the hamlet-size group also includes friends…. “How extensive is Turkana social structure? On the one hand, there are indicators of ‘tribal’ integration. The Turkana say, ‘We are all brothers,’ and respect this tribal identity by rarely raiding or using spears against one another (bandits, *igorokos*, are exceptions). They know and acknowledge the ‘territorial’ names of their regions. They also belong to clans, some of them small and localized, others widespread throughout Turkana land. In past times, apparently, whole regions of Turkana mustered thousands of warriors against non-Turkana enemies. so, the turkana outbreed, and they have loose family and social structures. friends seem to be important (as important as family?). the turkana are individualistic, yet share readily with their friends. “Warfare is traditionally an essential part of Turkana life and the principal occupation of young men. Weapons are considered a man’s proud possessions and the practical tool for increasing herds by raiding and for expanding their territory. 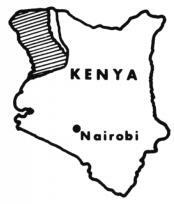 Ever since they entered Kenya, the Turkana have been in a perpetual process of expansion. Previously settled tribes such as the Samburu, Pokot, Donyiro, Toposa and Karamojong were forced out of their territory by belligerent Turkana warriors (Gulliver, 1951: 143). No administration has ever able completely to contain the Turkana and put an end to these conflicts. These common age-old pursuits still trouble independent Kenya. “Moscow, 4 January 2002 (RFE/RL) — The Chechens of Russia’s North Caucasus region are a tight-knit society based on extended families, or clans, guided by a council of elders. These clans, which traditionally lived together in a single village, are called ‘taips.’ During Stalin’s infamous deportation of Chechens to Central Asia — and even now, as war and social unrest have forced thousands of Chechens to leave their home villages and scatter throughout the republic or abandon the region altogether — the links remain strong between members of a single taip. “There are more than 150 taips in Chechnya, each with its own traditions and council of elders…. “Traditionally, taip members can recall the name of their original ancestor from whom the clan originates. They can also recite the names and details about the lives and deaths — often on the battlefield — of at least seven generations of male ancestors. “Ian Chesnov is an anthropology professor at Russia’s State Humanitarian University in Moscow. He spent several years in Chechnya studying cultural traits. Chesnov says that according to Caucasus tradition, a member of a taip is never abandoned in time of trouble. To the contrary, a taip acts as a kind of family network that makes sure all members have the support they need…. “The taip forms the core of Chechen society — and, many Chechens believe, predetermines the characteristics and personalities of its members. The perceived link between clan and character type is so strong that taips are considered a key aspect of the region’s political life as well…. so, do the chechens inbreed/mate closely? according to the working theory around here, they ought to if they’re clannish (and they are). we should also be able to guess that the chechens have a history of inbreeding/close mating since they live in the mountains, and mountainous populations seem to have a tendency to inbreed (see also here) — like the auvergnats, for example. – you can marry maternal relatives, but probably not closer than third cousins — this cousin marriage ban is probably a holdover from when the chechens were christian [pg. 256]. in fact, third cousin marriages might even be preferred (this reminds me of the greeks). all of this sounds almost exactly like the marriage systems amongst some of the populations in the balkans, especially amongst the albanians — i.e. avoiding paternal cousin marriage but allowing maternal (distant) cousin marriage. a bit of exogamy, but also a bit of endogamy. size also matters. the smaller your population size, the smaller the gene pool is going to be and, so, the closer the mating ultimately — which is what matters here (i think). there are 1,206,551 chechens in chechnya as of 2010 — let’s call it 1.2M. there are somewhere between 130 and 300 teips (patrlineal clans) in chechnya — let’s call it 215 (that’s right in the middle). that gives us ca. 5,580 individuals per teip. there are nine tukkhums (the larger tribes) in chechnya. if we assume that there is the same number of teips in each tukkhum (which might not be the case), then that’s ca. 23-24 teips per tukkhum. 5,580 x 24 = 133,920 individuals in a tukkhum. how many of reproductive age (i never know this)? one quarter? one third? if it’s one quarter, you wind up with ca. 16,700 women you are allowed to marry if you’re a chechen guy. compare that to the millions you could marry in the u.s. — if you’re american. so chechens are close breeders. they’re a small population that marries within an even smaller tribe and may even prefer maternal third cousin marriage. see also: Inside the deadly Russian region the Tsnarnaev family used to call home @foreign policy and Chechen asabiya and the Borat Brothers from steve sailer. *update* – and see also One Blessing Of Outbreeding from roissy. africa, africans, amhara, biology 101, biology and behavior, biology and culture, biology matters, christians, different peoples is different (duh! ), dizi, east africa, endogamous mating, endogamy, ethiopia, ethiopian jews, ethiopians, exogamous mating, exogamy, inbreeding, inclusive fitness, jews, kissin' cousins, mating patterns matter, oromo, relatedness matters, tagray, what's this hbd business all about anyway? so, the beta israel are very outbred within their extended family (zamad). it’s not clear to me who a preferred marriage partner might be — someone from one’s own zamad, just beyond sixth cousin? or someone from another zamad? and if it’s someone from another zamad, is it someone from another zamad from the same village? inquiring minds want to know! so, i decided to look around to see if i could find out anything about the mating patterns of other groups of ethiopians — i recalled seeing something about this prohibition against sixth cousin marriage, or something like that, somewhere else (i think it was here on wikipedia). first of all, there are several different ethnic groups in ethiopia, of course: oromo, amhara, tagray, etc. — some are cushitic, others semitic, others nilotic — many are christians, some are muslims. “In the central highland societies of Amhara, Tagray, several Gurage groups, but also among the Omotic-speaking Dizi in the south-west, clans do not exist and people trace descent along bilateral lines. Both the above types rest on ideas of lineal kinship through descent from a father’s line, a mother’s line or through both, but bilateral tracing or ambilineality excludes clanship. Males and females can inherit through both their mother’s and father’s line, but actualization of the rights of the claims is strongly situational. “bet” like beta israel? prolly. neato! except for the conflict part. doesn’t sound all that foreign (if you’re a europoid), eh? and, of course, it’s not the bilateral kinship system that’s led to the “highly individualistic ethos” but, rather, all the oubreeding. five generations back means a prohibition against marrying anyone closer than fourth-cousins. that’s closer endogamy, then, than the amhara, etc., who won’t marry sixth cousins or closer (as a general rule). it also sounds like the oromo might favor marrying within the clan, just beyond fourth-cousins. polygamy, too, also narrows the degrees of genetic relatedness within a group of people. ethiopia sounds like an interesting place with regard to mating patterns — there are many different groups with a variety of different mating traditions, unlike western europe which just sorta has two broad patterns — in the north, don’t marry your cousins — in the south, don’t marry your cousins either, but we’ll let you get away with marrying your cousins more than they do in the north. will have to learn more about ethiopia!